Since 1947 Nabertherm builds different types of pottery kilns in Lilienthal closed to Bremen. The kilns are used by hobby artists but also by professional potteries and ceramicists, schools, ceramic departments of universities or even ceramic industries. All pottery kilns are manufactured by hand to guarantee a high quality. State of the art technology like energy saving insulation or fast switching solid state relays are standard; independent if you are looking for a small top loading ceramic kiln with or even chamber pottery kilns with heating from three- or five sides with volume up to 2200 liters. 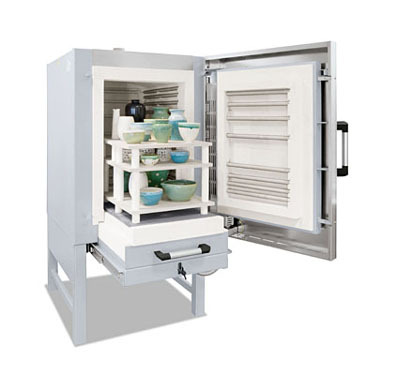 A further advantage of Nabertherm pottery kilns is the high temperature uniformity and intuitive to use control system. The complete firing cycle will be controlled by a controller. We offer a large variety of pottery kilns, electrically or gas heated, and also customized pottery kilns are available. The most common pottery kilns are available from stock for a fast delivery. Our engineering team of more than 40 engineers would be glad to design also a solution for your application, if none of our standard products fits for your requirements. In addition to the pottery kiln we support you world wide with a fast spare parts service for our pottery kilns. Further information on Nabertherm Pottery Kilns.